engineering, involving a variety of performance and cost trade-offs. Spot size w ~ x·x’/ α, goes as transverse phase space. Index of refraction < 1, can be used to make a refractive lens. photon flux to the experiment. wavelength is shortened by gamma. frame. This produces nonlinear motion and harmonics. by another factor of gamma. Energy spread typically < 0.1% (except in bunch compressors). 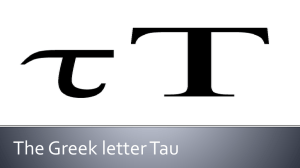 – εx=π·δx·δx’, usually quoted in “pi millimeter milliradians”, or “microns”. – Normalized emittance εn= ε·γ is also invariant with acceleration. – Typical normalized emittances ~ 1um. – synchrotron beams are fairly long (several mm long, 100um wide). 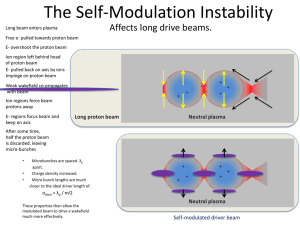 – FEL beams are ~spherical (30um long and wide). – Beams are much longer (~1M) than they are wide (~50um). – Undulator is ~3mm (shorter than the electron bunch!). – Microbunching is 3um in a 50um beam, 15:1, not so extreme. Beam properties mostly determined by the injector. maybe not in a usable phase space). 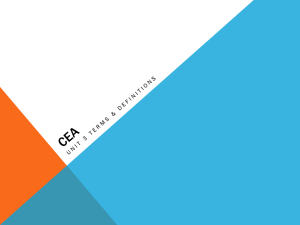 – Can be described in emittance units as ~104um. High energy, low emittance rings. 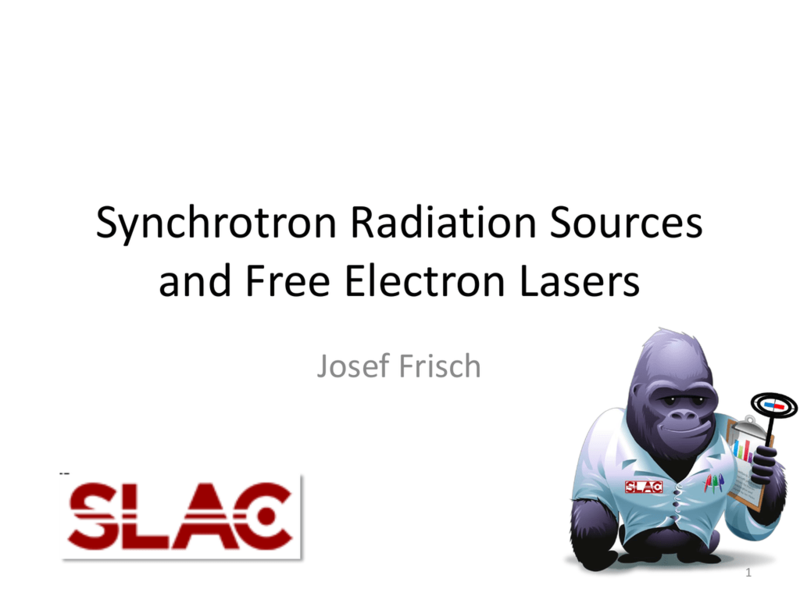 high brightness source is critical for LINAC based FELs. Want minimum transverse momentum spread (cold beam). Surface roughness can increase transverse momentum spread, want < 10s of nanometers. Thermal emission from heated cathode to produce beam. comparable due to different bunch lengths! driven by a high power RF source. planes!) provide average focusing for the electron beam. – Can run CW at lower gradient. 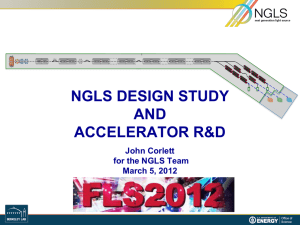 SC accelerators are more expensive per GeV than RT accelerators (maybe X2??). 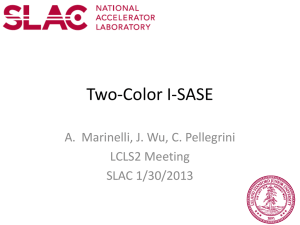 Continuous beam SC accelerators are another factor of ~X2 more. particles follow a shorter path. When an electron bunch propagates through a LINAC it generates “wakefields”. Transverse wakes can kick the tail of the bunch relative to the head. Longidudinal wakes decelerate the tail of the bunch. – This is actually an advantage: Can cancel the energy chirp put on the beam for compression. • FELs have higher gain and better efficiency with higher peak currents. valuable for future FEL projects. the bunching required for gain will be washed out. 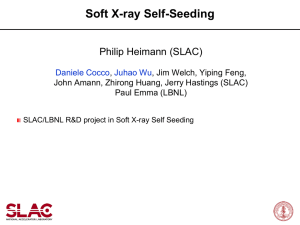 – X-ray FELs place very stringent requirements on the electron beam. 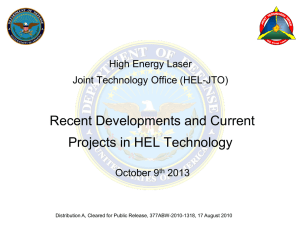 a laser, but this is not necessary or convenient for any proposed FELs. Much more intuitive to consider as a fully classical system. Alternating magnetic field, wavelength of a few cm. Fixed Gap Undulator: Simple, high fields, good tolerances. results in lower resonant E-beam energy. • FEL light is amplified noise: 10-100X transform limited bandwidth. – Allows control of bandwidth, pulse length etc. – For hard X-rays can use Bragg diffraction from crystals. Laser seeding looks difficult for hard x-rays! ELETTRA. 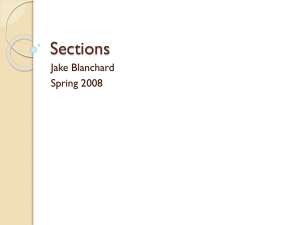 Self-seeding experiment planned at LCLS in fall 2011.
included at least as an option in all new designs. same delay as the monocromator. (can’t bend to far due to CSR). timed with the ringing pulse. Can generate up to ~100th harmonic in gas discharge, but efficiency is poor. At 10 KeV get <100aS, not a limit in the near future. Can operate at 20pC -> 7fs pulse. possibilities to go to ~1fs pulses (next talk). Most development work is on FELs. – European XFEL: 3 undulators to support simultaneous users. Narrower Linewidth to improve monocromator throughput. Higher repetition rate to reduce experiment time. – LCLS: 120Hz, SACLA 100Hz. Higher Peak Power for nonlinear and single-shot imaging experiments. 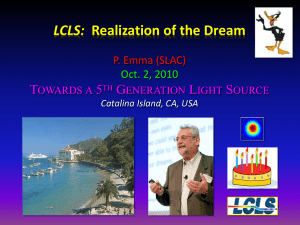 – LCLS maximum is ~70GW. ~100 KeV may be possible. average current than for a single-pass linac. energy beams in the same linac are challenging! Many experiments require high peak power, above the ~10s of GW from present FELs. Single molecule imaging would like ~2TW in a 100nm focus to allow alignment of images. Need < 20fs pulse before molecule explodes). improvements in the last decade! • X-ray systems: Diagnostics, mirrors, stoppers, etc. (but correlated) range of operating parameters. to know what to ask for. source for production semiconductor lithography.